Coordinators: Horsman Peter, Conway Brian E., Yeager E.
It is now time for a comprehensive treatise to look at the whole field of electrochemistry. The present treatise was conceived in 1974, and the earliest invitations to authors for contributions were made in 1975. The completion of the early volumes has been delayed by various factors. There has been no attempt to make each article emphasize the most recent situation at the expense of an overall statement of the modern view. This treatise is not a collection of articles from Recent Advances in Electrochemistry or Modern Aspects of Electrochemistry. It is an attempt at making a mature statement about the present position in the vast area of what is best looked at as a new interdisciplinary field. Texas A & M University J. O'M. 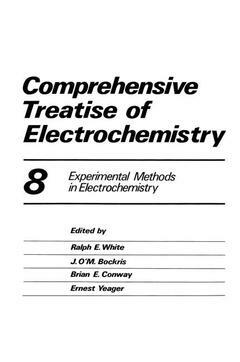 Bockris University of Ottawa B. E. Conway Case Western Reserve University Ernest Yeager Texas A & M University Ralph E. White Preface to Volume 8 Experimental methods in electrochemistry are becoming more diverse. This volume describes many of the new techniques that are being used as well as some of the well-established techniques. It begins with two chapters (1 and 2) on electronic instrumentation and methods for utilization of microcomputers for experimental data acquisition and reduction. Next, two chapters (3 and 4) on classical methods of electrochemical analysis are presented: ion selective electrodes and polarography. 1. Electronic Instrumentation for Electrochemical Studies.- 1. Introduction.- 2. Operational Amplifiers.- 2.1. Introduction.- 2.2. Functional Description.- 2.3. The Ideal Op Amp.- 2.4. Reality Regained.- 2.5. Static Errors.- 2.6. Dynamic Error and Stability.- 2.7. Noise.- 3. Further Building Blocks.- 3.1. Introduction.- 3.2. Threshold Detectors.- 3.3. Instrumental Amplifier.- 3.4. Current Follower.- 3.5. Voltage References.- 3.6. Current References.- 3.7. Operational Integrator.- 3.8. Operational Differentiator.- 3.9. Active Filter Design.- 4. Potential and Current Control.- 4.1. Introduction.- 4.2. Principles of Polarization Control.- 4.3. Potentiostat Design.- 4.4. IR Compensation.- 4.5. Dynamic Response of Potentiostats.- 4.6. Galvanostats.- 4.7. Negative Impedance Converters.- 5. Analog Analysis of Current and Voltage.- 5.1. Introduction.- 5.2. Frequency Domain Measurements: General.- 5.3. Audio Frequency Bridges.- 5.4. Transformer Ratio Arm Bridges.- 5.5. Berberian-Cole Bridge.- 5.6. Direct Measurement.- 6. Digital Analysis of Current and Voltage.- 6.1. Basic Principles.- 6.2. Interconversion of Analog and Digital Signals.- 6.3. Analog-to-Digital Conversion.- 6.4. Digital-to-Analog Conversion.- 6.5. Time-to-Digital Conversion.- 6.6. Transient Waveform Recorders.- 6.7. Computer Interfaces.- 6.8. On-Line Computer Data Analysis.- 7. Future Trends..- References.- 2. Computerization in Electroanalytical Chemistry.- 1. Introduction.- 2. Architecture of a Laboratory Computer.- 2.1. Internal Communication Buss.- 2.2. The Central Processor Unit.- 2.3. Memory.- 2.4. Operation Input and Output Devices.- 2.5. Experimental Input and Output Devices.- 2.6. Communication with I/O Devices.- 2.7. Experimental Timing.- 3. Programming Languages.- 4. Microprocessors.- 5. The Electrochemist and the Computer.- 5.1. Ion Selective Electrodes.- 5.2. Pulse Polarography.- 5.3. Anodic Stripping Voltammetry.- 5.4. Alternating Current Polarography.- 5.5. Conductance Measurement.- 6. The Future.- References.- 3. Electrochemistry of Ion-Selective Electrodes.- 1. Definitions and Principles.- 1.1. Membrane-Format Devices.- 1.2. Segmented Potential Model for Membrane Pd’s.- 1.3. Potential Profiles at Single Interfaces.- 1.4. Quasi-Thermodynamic Calculation of Interfacial Potential Differences.- 1.5. Potential Profiles and Potential Differences across the Interior of Membranes.- 1.6. Summary of Steady-State Diffusion Potentials and Total Membrane Potentials.- 1.7. Time-Dependent Membrane Potential Theory.- 1.8. Time-Dependent Membrane Potential Parameters.- 1.9. Potential-Time Responses after Activity Steps (Responses outside the Linear Regime).- 1.10. Potential-Time Responses for Solid Membrane Electrodes.- 2. Ion-Selective-Electrode and Membrane Electrode Formats and Materials.- 2.1. Conventional Ion-Selective Electrode (ISE) Formats—General Comments.- 2.2. Kinds of Cells.- 2.3. Materials.- 2.4. Interfaces and Reversible Ion Exchange.- 3. Types of Ion-Selective Electrodes.- 3.1. Crystalline, Primary, or Homogeneous Electrodes: Composition, Interferences, and Sensitivities.- 3.2. Crystalline, Primary, Heterogeneous Electrodes.- 3.3. Noncrystalline, Primary, Heterogeneous, and Homogeneous: Compositions, Interferences, and Sensitivities.- 3.4. Sensitized Ion-Selective Electrodes.- 3.5. Reference Electrodes and Combination Electrodes.- 4. Response Equations for the Steady State, Response Parameters and Examples.- 4.1. Noncrystalline, Primary, Heterogeneous, and Homogeneous.- 4.2. Glass Electrodes.- 4.3. Crystalline, Primary, Homogeneous, and Heterogeneous Electrodes (with One Charge Carrier).- 4.4. Junction and Diffusion Potentials.- 4.5. Activity, Activity Coefficients, and Ionic Strength.- 4.6. Junction Structure, Cracks, and Leaks.- 4.7. Selectivity Coefficients and Interferences.- 4.8. Low Activity Limits by Dilution (Detection Limits).- References.- 4. Polarography.- 1. Introduction.- 2. Principle of Polarographic Measurements.- 3. Drooping (Streaming and Hanging) Mercury Electrodes.- 4. Charging Current.- 5. Diffusion Controlled Processes.- 5.1. Ilkovi? Equation.- 5.2. Correction for Spherical Diffusion in the Ilkovi? Equation.- 5.3. Diffusion Current at a Streaming Electrode.- 6. Polarographic Diffusion-Controlled Waves.- 6.1. Differential (Derivative) Polarography.- 6.2. Diffusion-Controlled Waves of Complexes.- 6.3. Diffusion-Controlled Waves of Organic Substances.- 7. Polarographic Waves with Diffusion and Charge-Transfer Control.- 7.1. Analysis of Polarographic Waves.- 7.2. Irreversible Reduction of Complexes.- 7.3. Irreversible Waves of Organic Substances.- 7.4. Double-Layer Effects on Polarographic Charge-Transfer Kinetics.- 8. Kinetic Currents.- 8.1. Preceding Chemical Reaction.- 8.2. Reactions Parallel to the Charge-Transfer Reaction. Catalytic Currents.- 8.3. Subsequent Chemical Reactions (Follow-up Reactions—Postkinetic Waves).- 8.4. Double-Layer Effect on Kinetic Currents.- 8.5. Surface Kinetic Currents.- 8.6 Mixed Volume-Surface Kinetic Currents.- 8.7 Catalytic Currents of Hydrogen.- 9. Adsorption in Polarography.- 9.1. Adsorption of Reactant or Product.- 9.2. Adsorption of Electroinactive Substances.- 10. Polarographic Maxima.- 10.1. Maxima of the First Kind.- 10.2. Maxima of the Second Kind.- 10.3. Maxima of the Third Kind.- 11. Techniques Developed from D-C Polarography.- 11.1 Square-Wave Polarography.- 11.2. Pulse Polarography.- 11.3. A-C Polarography.- 11.4. Nonlinear Polarographic Techniques.- 12. Applications of Polarography.- References.- 5. Ellipsometry.- 1. Introduction.- 2. Theory of Ellipsometry.- 2.1. Polarized Light.- 2.2. The Jones Calculus.- 2.3. Partially Polarized Light: Stokes Vectors.- 2.4. Reflection of Polarized Light.- 3. Analysis of Polarized Light.- 3.1. Optical Retarders: The Quarter Wave Plate.- 3.2. Classification of Types of Ellipsometers.- 3.3. Null-Seeking Ellipsometry.- 3.4. Mueller Matrix Ellipsometry.- 4. Analysis of Results in Ellipsometry.- 4.1. The Three-Layer Models.- 4.2. Multilayer Models.- 4.3. Experimental Errors.- 4.4. Why is Ellipsometry So Sensitive?.- 5. Examples.- 5.1. Thin Nonabsorbing Anisotropic Layer on a Nonabsorbing Substrate.- 5.2. Rough Surfaces.- 5.3. Corrosion of Silver—A Multilayer Problem.- 6. Outlook.- References.- 6. Raman Spectroscopy.- 1. Introduction.- 2. Raman Vibrational Spectroscopy.- 2.1. Vibrations and Symmetry.- 2.2. Classical Interpretation of Raman Scattering.- 2.3. Depolarization Ratios.- 2.4. Experimental Details.- 3. The Electrochemical Cell.- 4. Review of Early Work.- 4.1. Species in Solution.- 4.2. Thin Films on Electrode Surfaces.- 4.3. Adsorbed Species at the Electrode/Electrolyte Interface.- 5. Surface Enhanced Raman Scattering (SERS) of Pyridine on Silver.- 5.1. Intensity of SERS Spectra.- 5.2. The Effect of Laser Excitation Frequency.- 5.3. SERS from Different Silver Crystal Planes.- 5.4. The Effect of Laser Power.- 5.5. Depolarization Ratios.- 5.6. Angular Dependence of Incident Radiation.- 5.7. The Halide Ion and Pyridine.- 5.8. Lewis Acid Adsorbed Pyridine.- 5.9. pH Dependence of the SERS of Pyridine.- 5.10. Differential Capacitance Measurements.- 5.11. Potential Modulation of SERS Spectra.- 5.12. Build-up of SERS during the Roughening Cycle and with Time.- 5.13. Observation of SERS Spectra from Metal Sols and the Relationship to Roughened Electrodes.- 5.14. Observation of SERS via Excitation of Surface Plasmons.- 5.15. Effect of Other Metals in Silver Alloys on SERS.- 6. The Background Spectrum.- 6.1. The Background Continuum.- 6.2. The “Carboxy” Background.- 7. Adsorption of Halide Ions with Coadsorbed Water.- 8. The Adsorption of Cyanide Ions.- 9. Experiments Relevant to the Physical and Chemical Origins of the SERS Effect.- 10. The Origins of SERS.- 11. The Enhancement Mechanisms.- 11.1 Conventional Resonance Raman Scattering.- 11.2. Surface-Induced Resonance Raman Scattering (SIRRS).- 11.3. Enhancement via Coupling with Surface Electromagnetic Waves.- 11.4. Resonance Raman Scattering via Electron Tunnelling Processes.- 11.5. Image Field Raman Scattering Mechanisms.- 11.6. Electric Field Intensity Enhancement Mechanisms.- 11.7. Electron-Hole Pair Scattering Mechanisms.- 11.8. Modulated Reflectance Raman Scattering Mechanisms.- 11.9. Enhancement Models Involving More Than One Mechanism.- 12. Assessment of Present Position and Prospects.- References.- 7. Electron Spin Resonance.- 1. Introduction.- 2. Principles of ESR Spectroscopy.- 3. Information Drawn from ESR Data.- 4. Techniques of External Radical Generation.- 5. Internal Generation of Radicals.- References.- 8. Electron Spectroscopy for Chemical Analysis (ESCA) and Electrode Surface Chemistry.- 1. Introduction.- 2. Spectral Interpretation.- 3. Coupling of Electrochemical and ESCA Studies.- 4. Anodic Film Formation on Metal Electrodes.- 5. Anodic Film Formation on Alloys.- 6. Electrochemical Deposition.- 7. Electrocatalysis.- 8. Conclusions.- References.- 9. Field Ion Microscopy.- 1. Introduction.- 2. Operation of the FIM.- 2.1. Field Ionization.- 2.2. Field Evaporation.- 2.3. Field-Induced Stresses.- 2.4. Similarity of FIM atid Electrochemical Interface.- 3. Experimental Features of FIM.- 3.1. FIM System Requirements.- 3.2. Tip Preparation.- 3.3. Image Amplification and Photography.- 3.4. Image Interpretation.- 3.5. Electrochemical Operations on FIM Tips.- 4. Applications and Suggested Experiments.- 4.1. Electrodeposition: Previous Work.- 4.2. Suggested Electrodeposition Studies.- 4.3. Electrocatalysis.- 4.4. Corrosion.- Acknowledgment.- References.- 10. Application of Electron Microscopy to Electrochemical Analysis.- 1. Introduction.- 2. Survey of Methods.- 3. Sample Preparations.- 4. Sample Analysis.- 5. Summary and Conclusions.- Standard Reference Texts.- 11. Classified Bibliography of Electroanalytical Applications.- 1. Polarography.- 1.1. D-C Polarography.- 1.2. Differential and Derivative Polarography.- 1.3. Oscillographic Polarography.- 1.4. A-C Polarography.- 1.5. Square-Wave Polarography.- 1.6. Radio Frequency Polarography.- 1.7. Pulse, Differential Pulse Polarography.- 2. Linear Potential Sweep and Cyclic Voltammetry.- 2.1. General Principles and Theory.- 2.2. Instrumentation.- 2.3. Applications.- 3. Stripping Voltammetry.- 3.1. General Principles and Theory.- 3.2. Instrumentation, Electrodes, and Cells.- 3.3. Applications—Anodic.- 3.4. Applications—Cathodic.- 4. Ion Selective Electrodes (ISE).- 4.A.1. Books and Reviews.- 4.A.2. Instrumentation and Method of Preparation.- 4.A.3. Applications.- 4.B.1. Solid Membrane Electrodes: Theory.- 4.B.2. Solid Membrane Electrodes: Instrumentation and Methods of Preparation.- 4.B.3. Solid Membrane Electrodes: Applications.- 4.C.1. Liquid Ion Exchange Membrane Electrodes: Theory.- 4.C.2. Liquid Ion Exchange Membrane Electrodes: Instrumentation and Method of Preparation.- 4.C.3. Liquid Ion Exchange Membrane Electrodes: Applications.- 4.D.1. Enzyme Electrodes: Theory.- 4.D.2. Enzyme Electrodes: Instrumentation and Method of Preparation.- 4.D.3. Enzyme Electrodes: Applications.- 5. Coulometry.- 5.1. General Principles, Reviews, and Books.- 5.2. Theory and Its Application to Kinetic Studies.- 5.3. Instrumentation, Cells, etc..- 5.4. Applications.- 6. Chronopotentiometry.- 6.1. General Principles and Theory.- 6.2. Applications.- 7. Special Electrode Materials.- 7.1. Alloy Electrodes.- 7.2. Solid Electrodes.- 7.3. Liquid Electrodes.- 8. Special Cells and Electrode Configurations.- 8.1. Thin Layer Cells: Theory, Methodology, and Application.- 8.2. Rotating Ring Disc Electrode and Related Configurations.- 8.3. Microelectrodes.- 9. Spectroelectroanalytical Chemistry.- 9.1. General Principles and Reviews.- 9.2. X-Ray Photoelectron Spectroelectrochemistry.- 9.3. Auger Electron Spectroelectrochemistry.- 9.4. Low Energy Electron Diffraction Spectroelectrochemistry.- 9.5. Raman Spectroelectrochemistry.- 9.6. Reflection Spectroelectrochemistry.- 9.6.1. Internal Reflection Spectroelectrochemistry.- 9.6.2. Specular Reflection Spectroelectrochemistry.- 9.7. Ellipsometry.- 9.8. Transmission Spectroelectrochemistry.- 9.9 Other Spectroelectrochemical Techniques.